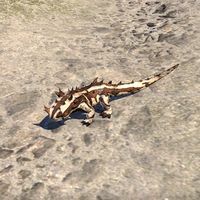 A type of gecko that is found in the desert. A type of eel that can be found on Auridon. Thunderbugs are hostile insectoid creatures that use lightning based attacks. 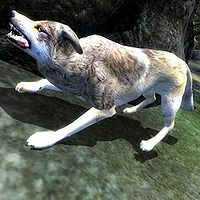 Native to Cyrodiil, timber wolves are larger and stronger than ordinary wolves. The giant Doom Wolf was originally bred from timber wolves taken from the southern Jerall Mountains. 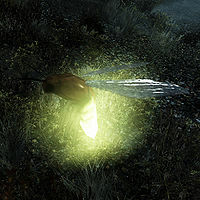 Torchbugs are small, nocturnal insects that are frequently found in the more temperate areas of Skyrim. They are prized for the usefulness in crafting potions. In Black Marsh within Murkmire, Torchbugs give off a red glow. 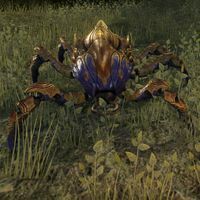 A type of common fish that can be found in foul water across Tamriel. Trolls are large, ape-like, dim-witted humanoids endowed with three eyes. Their powerful arms and claws deal massive physical damage. Trolls regenerate themselves quite quickly, an ability that is only annulled if exposed to fire. In some cases their regeneration prevents their death completely, making the scorching of their corpses the only way to truly kill them. 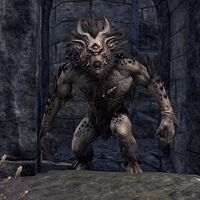 Trolls are found all over Tamriel, mostly in caves and forested areas. The Frost Troll found at higher elevations is a stronger cousin of its lowland variety. Other varieties include Swamp Trolls, River Trolls, and Lowland Trolls. Weak trolls are sometimes known as Trollkin. Trolls are known to sometimes grow to tremendous sizes, and were much larger and more powerful during the chaos of the Dawn Era. A type of oily water fish that can be found in foul water in the Clockwork City. This page was last modified on 23 October 2018, at 20:09.